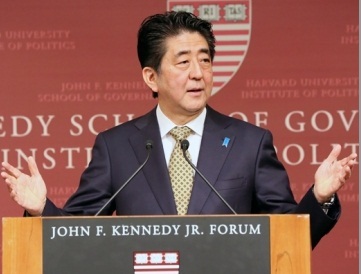 Washington DC: Shinzo Abe, the first Japanese Prime Minister ever to address the joint meeting of the US Congress on Wednesday said as for U.S. – Japan negotiations, the goal is near. Let us bring the TPP to a successful conclusion through our joint leadership. Zooming in on the entire concept of Trans-Pacific Partnership, Abe said; “prosperity was fostered first by the U.S., and second by Japan. And prosperity is nothing less than the seedbed for peace. That is for the sake of our children and our children’s children. Reflecting on the post-World War II phase, Abe said About the post-war phase, Abe said: “70 years ago, Japan had been reduced to ashes. Abe, who studied in California and also took a job at a steelmaker said the American culture has ‘intoxicated’ him. “in the U.S. rank and hierarchy are neither here nor there. People advance based on merit. When you discuss things you don’t pay much attention to who is junior or senior. You just choose the best idea, no matter who the idea was from”, the Japanese Prime Minister observed. Expressing deep repentance, Abe said: “The battles engraved at the Memorial crossed my mind, and I reflected upon the lost dreams and lost futures of those young Americans. Drawing attention to Lt. Gen. Lawrence Snowden in the gallery, Abe said, Seventy years ago in February, he had landed on Iōtō, or the island of Iwo Jima, as a captain in command of a company. In recent years, General Snowden has often participated in the memorial services held jointly by Japan and the U.S. on Iōtō. Next to General. Snowden sits Diet Member Yoshitaka Shindo, who is a former member of my Cabinet. His grandfather, General Tadamichi Kuribayashi, whose valor we remember even today, was the commander of the Japanese garrison during the Battle of Iwo Jima. Source: Citation from Official Website of the Prime Minister of Japan and His Cabinet (http://japan.kantei.go.jp/97_abe/statement/201504/uscongress.html).